April, 20, 2016 – This week, the City of Grand Junction hosted a series of meetings on the Jordan Cove LNG project, which was rejected by the Federal Energy Regulatory Commission (FERC) last month. The proposed pipeline plays an important role in transporting liquefied natural gas from Colorado to the West Coast for international trade. Sen. Michael Bennet spoke in support of the project and referenced a recent white paper by GJEP that highlights the potentially significant positive economic impact of exports of Western Colorado gas supplies to Asian markets. See Sen. Bennet’s full address here. 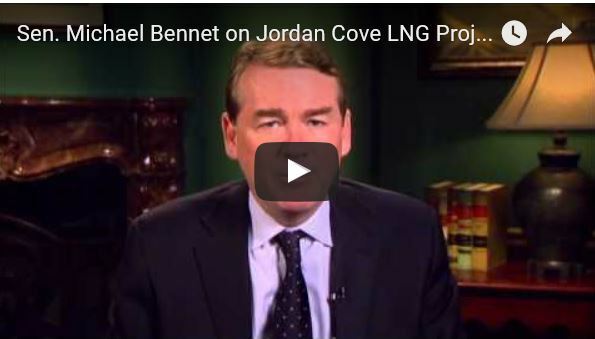 Download GJEP’s white paper on LNG exports and the Jordan Cove here.